Facebook COO Sheryl Sandberg said Wednesday before a Senate committee that Facebook is taking a multitude of steps to censor content they deem "false," including by showing users "alternative facts." "Finding a line between what is hate speech and what is misinformation is very, very difficult, especially if you're dedicated to expressing free expression, and sometime free expressing is expressing things you strongly disagree with," Sandberg said. "In the case of misinformation, what we do is we refer it to third-party fact-checkers," she said. "We don't think we should be the arbiter of what's true what’s false, and we think that's really important. Third-party fact-checkers then mark it as false. If it’s marked as false, we dramatically decrease the distribution on our site, we warn you if you're about to share it, we warn you if you have shared it, and importantly, we show related articles next to that so people can see alternative facts." 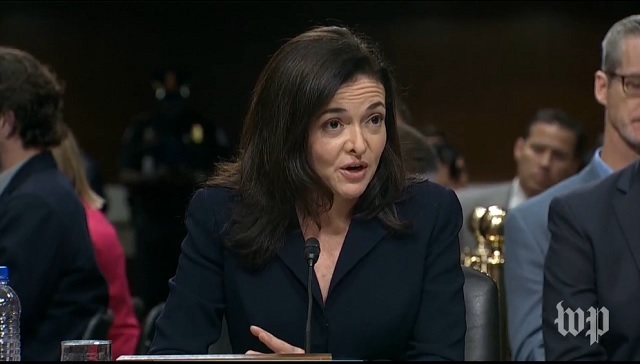 Sandberg continued: "The fundamental view is that, bad speech can often be countered by good speech, and if someone says something not true and they say it incorrectly, someone else has the opportunity to say, 'Actually, you are wrong. This is true,' and that's what we’re working on through our systems." While Kellyanne Conway was put through the wringer for using the term, odds are Sandberg's statement will be ignored, especially considering it's fake news outlets like CNN, the AP and so on who get to have their "alternative facts" shown alongside news their so-called "third party" moderators decide to censor. Mark Meadows noted yesterday Sheryl Sandberg and Jack Dorsey chose to go before the Energy and Commerce Committee where, "conveniently," none of the "shadow-banned" members of congress would be present. Twitter rejected an invitation from the Oversight Committee and instead opted to appear before the E&C Committee tomorrow on 'shadow-banning.' Conveniently, none of the 'shadow-banned' members (@Jim_Jordan, @mattgaetz, or myself) sit on E&C... so they avoid our questions. Alex Jones, who was banned completely by Facebook, showed up at the hearing, slammed social media censorship and confronted Senators Marco Rubio and Ron Wyden.